We have had 3D printers for a couple of years now. We bought our first Up3D printer a few years back for about $4500. Then at the start of 2013 we made an active decision to use the technology of the day in our technology centre with a client school. We bought (leased) another two Up Printers and one Up Mini Printer along with a pod of 8 MacBook Pro laptops so that we could look at a design focus in addition to more traditional forms of technology education. Within the first three months of 2013 the Hard Materials technology teacher and I had built two Version 1 DiamondMind printers which used a more sustainable form of filament (PLA), open source software, and off the shelf electronic components – all in a kit set form from Mindkits. These printers were under half the price of the UP printers, over double the print area, made in New Zealand and most importantly – you could fix/tweak them yourself! 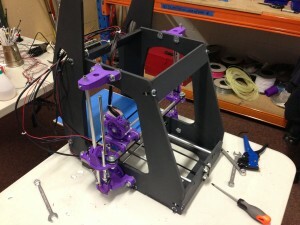 You also have the ability to print your own printer as these printers fall into the RepRap category. These printers were featured on Breakfast on One with our school providing a little of the education context for the printer. 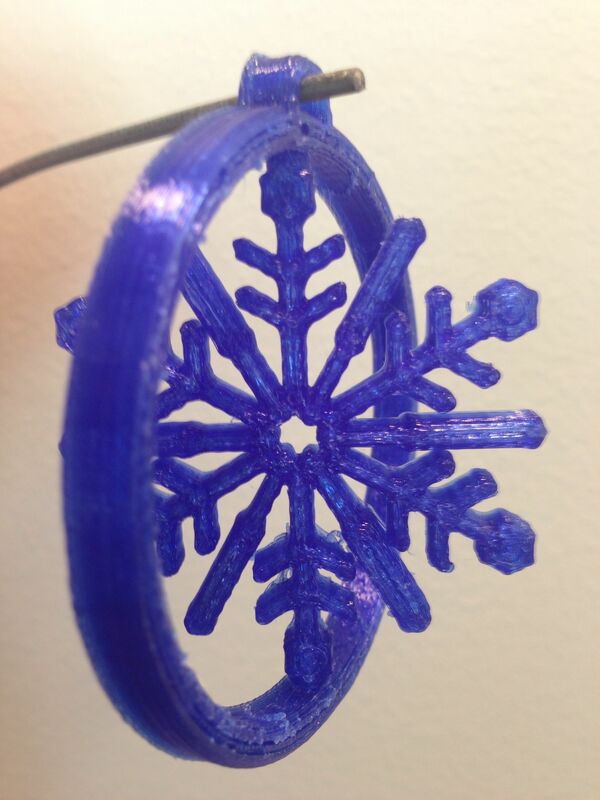 We have had students using a variety of applications for designing in 3D and the printers provide the physical result of that design. 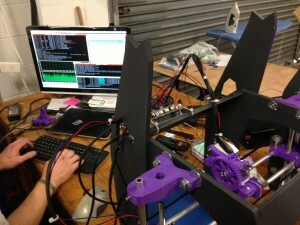 Why 3D printers – they are a gimmick, right? 3D printers are not new technology – in fact in using 3D printers we are not preparing kids for their futures – we are just using the technology of the day – the here and now. 3D printers are more than printing plastic models and must be seen in the bigger picture of thinking digitally in 3 dimensions. Being able to print out the end product is a bonus. I see 3D printing as creation – we can design / draw in Google SketchUp (remember NZ Schools get your 2013 Pro version codes from Datacom – no need for an .stl plugin), FormZ, TinkerCad, OpenSCAD and then have that design built for us to use. At our place the printers have been used to produce attachments for robots, stands for devices, key rings, buttons, moulds for chocolate, replacement plastic parts – even hooks for school bags (normally $15 per hook for metal under a dollar to produce your own!) Hydroponics containers, modelling prototype wind turbines. Art projects in a virtual world can become physical through the act of printing them out – vases, bracelets and functional artwork. Imagine being able to produce or replicate your digital creation in the physical world. However the tool is only an instrument of the creative person behind it. As teachers we need to focus on unleashing this creative potential in a digital age. The power comes when you combine the printing with other maker technology like Arduino (micro-controllers) and electronics. I witnessed an example of this when I had a group of kids putting together arduino light sensing robots from @zombiebothq, the robot has no body – it is over to the kids to make this out of cardboard, lego or wood or as one 10 year old said “I could take measurements of the arduino and the breadboard and draw a case for it in SketchUp then print it out!” – CREATION! As always the teacher is crucial – let us look at the normal laser colour printer – yes you could download resources from Sparkle Box and print them – is that creation? The same with 3D printers, you can download from Thingiverse, you could scan using 123DCatch and print out someone’s head, or you could CREATE. This is the new frontier, do you remember getting your kids to design an amazing playground? As teachers we usually said let’s build a model of it to sell the idea to the Board of Trustees. The resultant model looked rubbish as it was made of tooth picks, cardboard and toilet rolls. Kids know that the model is budget! 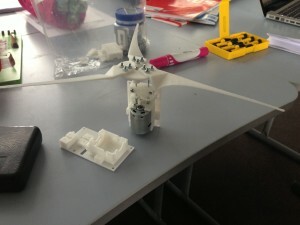 But design it virtually in 3D and then have the bonus of printing it as a scale model? The product actually looks like the design. This increases engagement. We will be printing our own spare parts for everyday items within 5 years – these will be downloaded to your home printer and then printed. Our kids must be able to work in a 3D virtual space in order to be creators. To those who say ‘I can’t see the point’ I answer with a statement of my own – I can’t see the end to the possibilities. The key to the question is not the technology – in fact leave out the technology full stop! The real issue is us teachers – how are we creating opportunity for creative, innovative authentic learning using the technology of the now? The key for me as a leader has been to play and tinker with the technology. I had no clue at the start of the year I would have built a 3D printer (even though it was under expert supervision) I had no idea we would have students coding, Junior School kids using Scratch or Senior students collaborating with another group of year 8s in another school on the their own video game using Unity. 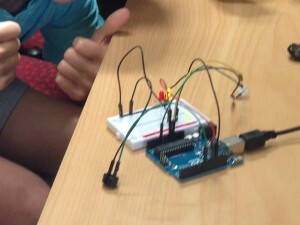 I had no idea of the impact that arduino technology would have on my view of bridging the analogue and digital worlds. More than anything the maker movement is having a powerful influence over my thinking about curriculum. The potential is huge! I cringed when a Member of Parliament and Honorary Fellow of the New Zealand Computer Society Maurice Williamson said 3D printers are dangerous as they can print guns. As a maker friend of mine said “if you want to build a gun you wouldn’t use a printer” This technology will be pervasive and, as with any technology, we will have creators and consumers – our kids need a creator mentality. I loved a comment from an 11 year old in my Zombie Robots group – “Hey Mr L I mucked around with the code look what we can make this circuit do now…” As teachers we need to ‘muck around with the code’ are we using the technology of the day, today? Are we relying on the technology to do it for us? Are we the slave to the technology bound by its apparent limitations or are we the masters of the technology making it bend to purpose? Tinkering and making is a natural human endeavour. We try to encourage it in our schools but how far do we go? We bought our first 3D printer a couple of years ago. To be able to draw on the computer and then print it out was indeed an amazing experience. 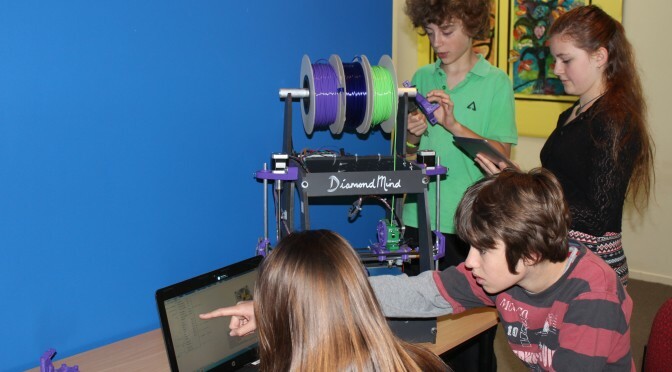 At the start of 2013 we bought another 3 commercial 3D printers and Ian Ingoe set about using them with a client school attending our technology centre – a brave move considering Ian hadn’t really worked with CAD or rapid prototyping. Mark Osborne introduced me to Arduino boards early in 2013 and then I attended KiwiFoo where the world of tinkering, hacking and making was opened to me. Thanks to Vik Olliver and Tim Carr we managed to build our own 3D printers – something I thought I would never do. all at under half the price of a commercial one and the best part – we knew how the printer worked! Combine this with the work that JJ Purton Jones and Rochelle Spicer are doing with coding during 2013 as well as the gifted and talented LEGO robotics programme led by Mary Fursdon and it is clear we are developing a maker culture. 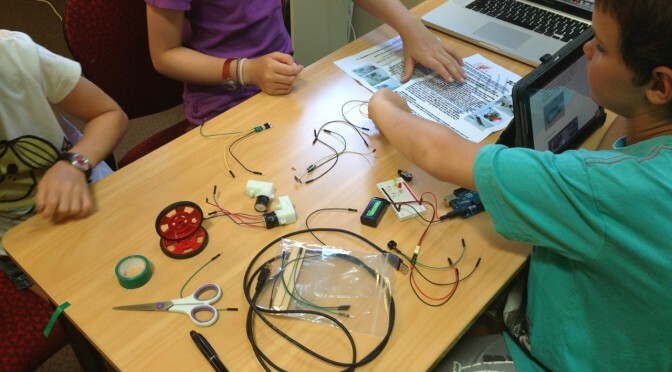 Toward the end of 2013 I started working with groups of children working on an innovative Arduino based maker project called Zombie Robots. Watching the problem solving and independent learning reinforced my thinking around deepening a maker culture at school. The next steps are already in place. Robotics is no longer the domain of the Gifted and Talented programme – all our year 7&8 children will experience LEGO robotics each week. We have a new teacher joining our technology centre! Kimberly Baars is into Robotics, Arduino, Rapid prototyping and wearable electronics! Zombie Robots will continue for small groups of students throughout the year. Kate Davison – a self confessed ‘mad scientist/artist creative who likes robotics’ joins our Junior Team and Dana Smith brings experience in student driven learning projects to the middle school! The maker coalition is building! The long term dream is to turn our Technology Centre into a 24/7 community maker space complete with laser cutters, rapid prototype printers, kilns and design space. We would welcome the community in to work alongside children so that their creativity and wisdom would rub off. 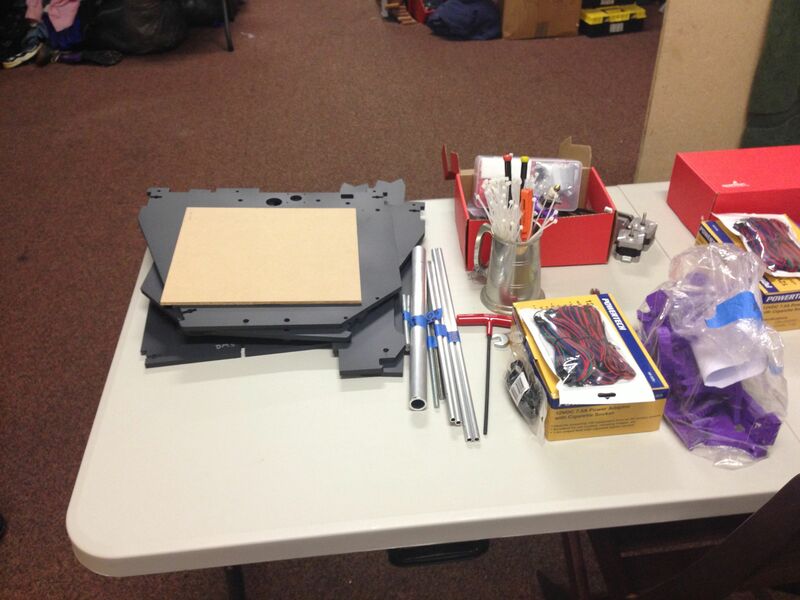 2014 will be about making steps and plans toward developing a maker culture. Progress and everyday stories will feature in this blog. 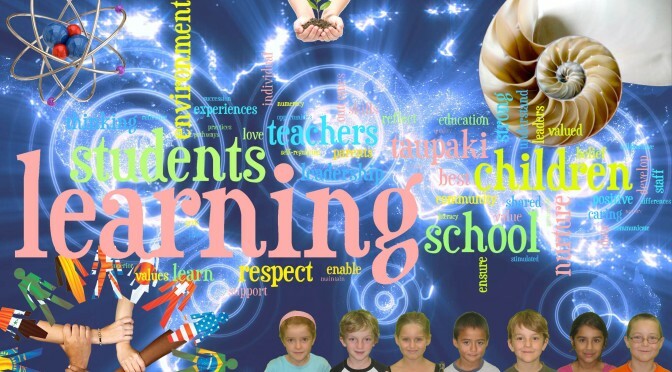 e-Learning is a recurrent theme in my recent presentations and discussions with visitors to Taupaki School. 21st century learning dominates conversations. We end up talking gadgets or apps and how to get teachers using them. When we get down to the nuts and bolts it really is about effective teaching and learning not the gadget or app! 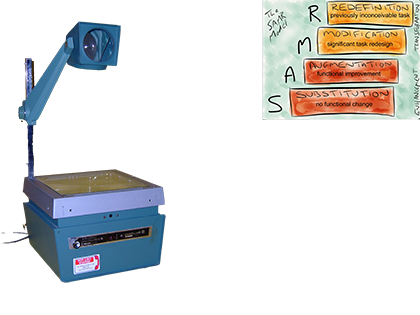 I like to use an example from when I was a primary school student in the 1980’s The gadget – The Overhead Projector. 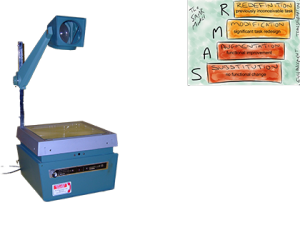 Most teachers thought – ‘Great I can write all the content for the class once, next year I use it again!’ I was lucky to have a teacher who used the OHP for the first Powerpoint I had seen – he used multiple transparency sheets to display the parts of a volcano. He then let us use the OHP to create shadow puppet plays. SAMR that! He thought of every creative way he could use that device – he failed, he redesigned and tried again! A quality example of learning. The point of the story is that the technology, the gadget or the app isn’t the silver bullet! We often think that we need to ‘Professionally Develop’ teachers to get them ‘up to speed’ with technology. 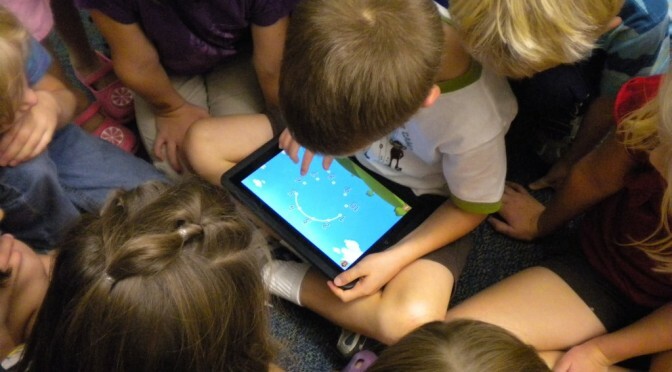 Do we need time set aside to allow teachers to play with the technology? Perhaps we need school cultures where risk-taking and mistake making extend to teachers. We definitely need to have a collective mental model that we need not be experts in order to use technology with kids. I am often asked what is the killer app or device. The answer is very simple there is one killer app in our schools – A thinking teacher who adapts to change by using the technology of the day effectively. After the last post about impending league tables I thought that I would post an article I wrote for the Teachers Matter magazine produced by the talented Karen Boyes @karenboyes from Spectrum Education. The article, written in 2008, tried to capture the opportunity of a New National Curriculum in New Zealand. It talks a little about change and a lot about the role of the teacher. How does this article sit in 2012? Interested in your thoughts. It never ceases to amaze me the range of responses we have to change. In fact the one certainty in our lives is just that, change. But how do we handle it? Where do we pick up the skills to deal with change? Is it largely to do with your outlook on life; the age-old adage of the glass being half empty or half full? Consider the following stereotypical responses to the Revised New Zealand Curriculum that I am sure you have all heard to varying degrees. The New Zealand Curriculum Vision talks about our young people being confident, connected, actively involved lifelong learners. Words like creative, energetic and enterprising sit side by side with resilient, resourceful and motivated. Our challenge is to model these very attributes in front of our students. Energetic, enthusiastic educators who model the NZC vision, values and key competencies is what our children need in their lives. Whenever I think about the role of enthusiasm and passion for learning in schools I reflect upon a conference I attended a few years ago where the keynote speaker crystallised my thoughts in a very public way. In his opening address he asked how many principals in the room were tired. A number of principals put up their hands. Then came the killer line… “Well then perhaps it is time to retire and let the energetic, enthusiastic people take over.” Whilst harsh and hard hitting it is true, schools are not the right place for those who have lost their spark. But rather than weeding out the unenthusiastic and tired people we have to find new ways to reignite the passion, perhaps one way to do this is the notion of legacy. What is your legacy? Someone once said to me that it is not what you teach it is how you teach it that will be remembered. Perhaps I am lucky that I had teachers as I was growing up who, whether they knew this or not, demonstrated this very point. What I value today is a result of how my teachers taught. Mr Kay taught me about persistence through Sport. Mrs Nicholls taught me about the joy of Music. Mr Thornewell taught me about curiosity, about questioning, he left with me a love of learning and most importantly he taught me about enthusiasm. At Intermediate Mrs Gribble taught me that looking at things from a different perspective opens up a range of new ideas and possibilities. At High School Mr Staniland, Mr White and Mr Druitt showed an enthusiasm and a passion for their given subject areas that was infectious. I must have learned all the other stuff, the ‘what’ of their teaching. But it is definitely the how that is their legacy and it remains with me. Currently we are grappling with curriculum change and the notion of explicitly teaching thinking and learning dispositions. We have schools adopting wonderful programmes like Costa’s Habits of Mind and Claxton’s Building Learning Power that build a child’s capacity to be successful in a rapidly changing world. How many of us model these dispositions? If we really think they are important for children to have, how are we using them successfully in our personal and professional lives? Dr John Edwards uses the example of de Bono’s six thinking hats tool. Lots of people use it in classes but how many of us use it in making decisions about the future direction of our schools, our lives? If not why teach it? So how do you stack up? What will the children of today say about how you taught them when they think back on their schooling… will how you taught be remembered at all? What will the residue be in 5, 10 or 20 years? Will they be reflective thinkers because you have explicitly modelled this in your classroom? Will they have an enthusiastic outlook on life because you were energetic about all that you did with them. Will they be creative because you allowed them the freedom to step outside the square more often than not? Will they love life and all it has to offer because you showed them something about your life outside of school. Will they treat others with dignity and respect because you walked the talk? Fortunately or unfortunately, depending on your glass, you can’t hide from the children you teach… they watch you, they pick up on your values, on your beliefs. You know from your own life experience that teachers leave a legacy, so why not leave a powerful one for your students. At the time we were looking at a new curriculum – I was excited. A lot has changed for us since then – but let us all remember the New Zealand Curriculum Document is still our guiding document it should drive our decision making, it should give us direction. Or are we doomed to only deliver and measure what is assessed as, after all, what you assess is what you deem to be important.